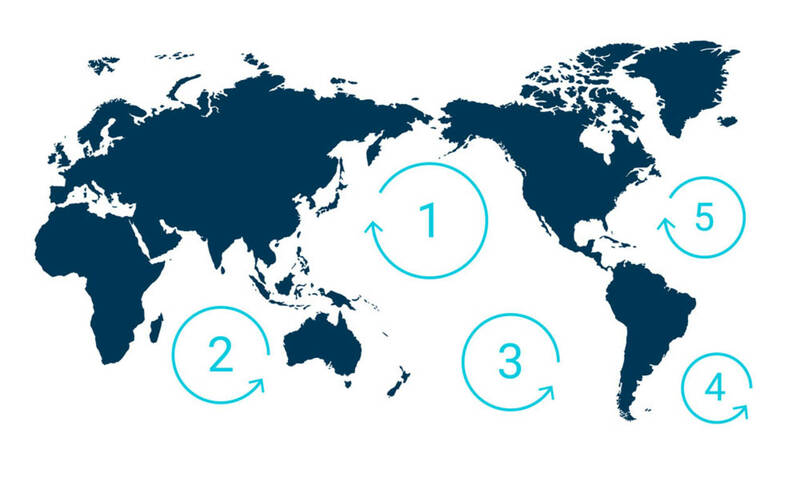 In the middle of our oceans are five floating islands of trash called offshore plastic accumulation zones. The largest of these zones is number 1, the Great Pacific Garbage Patch, and it is located between Hawaii and California. The garbage patch is made up of plastic debris that is not biodegradable and will, without interference, continue to grow from plastics fed into the ocean from rivers and streams across Asia, Australia, and Western North America. 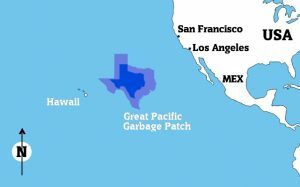 Right now, it is estimated that the Great Pacific Garbage Patch is approximately 100 million square miles in size, or, roughly twice the size of Texas. Because of tides and winds, it does move around some, but it is bas-ically in the big open space shown here on the map. And, while it covers the surface of the ocean for 100 square miles, it weighs an estimated 100,000 tons and is comprised of over 1.8 trillion pieces of plastic. That’s enough plastic for 250 pieces for every man, woman, and child on the planet. Like most things that float in a big mass, the patch is denser in the middle, about 100 pounds per square mile, and less dense at the edges where waves and wind lap at it; about 10 pounds per square mile. There are large items and small items in the patch, and they can be found as far as a three feet below the surface of the water, but often buoy and bounce up and down with the tide. So, what types of plastic are found in the Great Pacific Garbage Patch? Some are what you’d expect. Fishing line, fishing reels, and nets. But some are shocking. A soda crate from 1977. This Nintendo Gameboy from 1995. Chip bags and plastic shopping bags. Hard hats and toilet seat covers. As the debris floats it begins to break down in the sun and salt, creating millions of smaller pieces called micro plastics. These are even more dangerous as they can sink down to the sea floor to be ingested by wildlife. As fish mistake the plastic for food and ingest it, and we eat the fish, we are slowly poisoning ourselves because of the garbage patch and our carelessness in disposing of plastic. Ocean Cleanup, the organization that has been studying the Great Pacific Garbage Patch and its impact on the environment, launched a tug boat out of San Francisco in September, loaded with specialty collection equipment designed to begin cleaning the plastic from the ocean. While not as large, the four other garbage patches in the Atlantic Ocean, Indian Ocean, South Pacific and South Atlantic are also masses of plastic waste accumulated through runoff of rivers and streams. 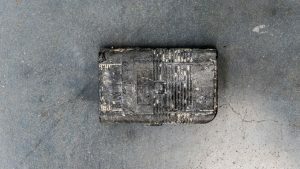 While Ocean Cleanup works on the Great Pacific Garbage Patch and learns how to clean the ocean there, it can take what it has learned to apply it to other areas. But all the cleanup in the world won’t help if we don’t stem the tide of plastic that ends up in our landfills, rivers, lakes, and streams. Here in the US, more and more states are banning plastic bags, straws, and other plastic storage containers in favor of reusable and recyclable alternatives like paper grocery bags, paper shipping box, and paper recycled envelopes. Even when discarded, paper bags biodegrade quickly and do not present the toxic dangers of plastics should they be ingested by wildlife. Let concern about the earth and use the recycle materials.